Featuring: Strawberry Rhubarb Fruit Topping, Strawberry Frosting & Oat Crumble. 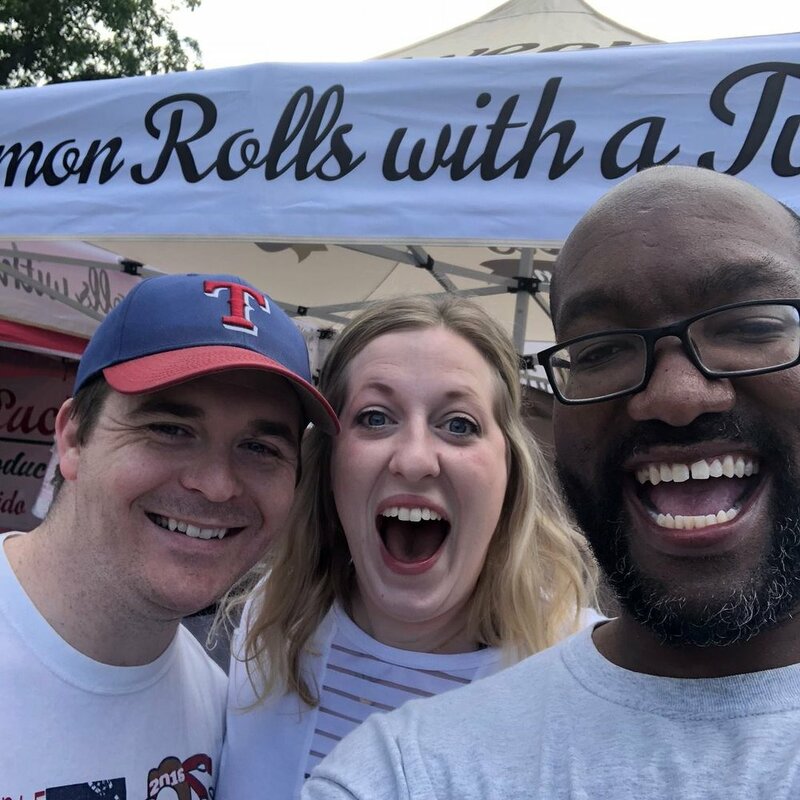 Sweet Rolls Denton is family-owned by Artiz, Monique and the three little Stroud boys. Deemed the "best cinnamon rolls ever!" by many of its' supporters, Sweet Rolls Denton has been serving up delicious selections as a home/cottage bakery since April 2016. 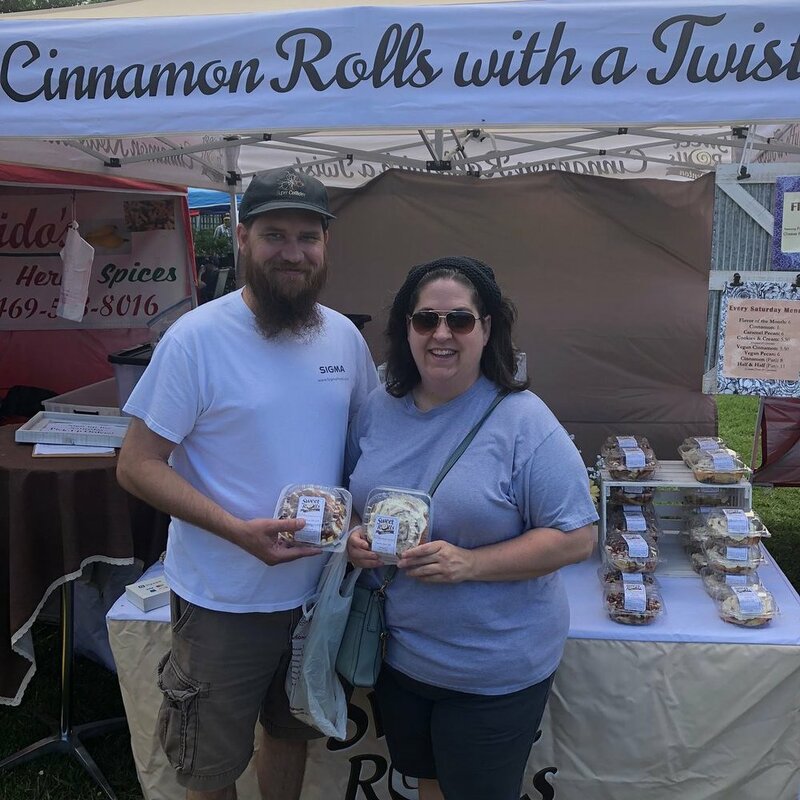 Supporters can find a variety of flavors such as Caramel Pecan, Classic Cinnamon, Vegan Cinnamon/Pecan, Cookies & Cream and the Flavor of the Month at Denton Community Market on Saturdays 9am-1pm. PAYMENT: Payment request will be emailed. If full payment is not made WITHIN 24 HOURS OF RECEIVING PAYMENT REQUEST, we will be unable to fill your order and it will be automatically cancelled. PAYMENT: Payment request will be emailed. If full payment is not done WITHIN 24 HOURS OF RECEIVING PAYMENT REQUEST, we will be unable to fill your order and it will be automatically cancelled. We operate as a cottage food bakery from our home. So, we currently do not have a store front. Where can I get Sweet Rolls? What are your hours? 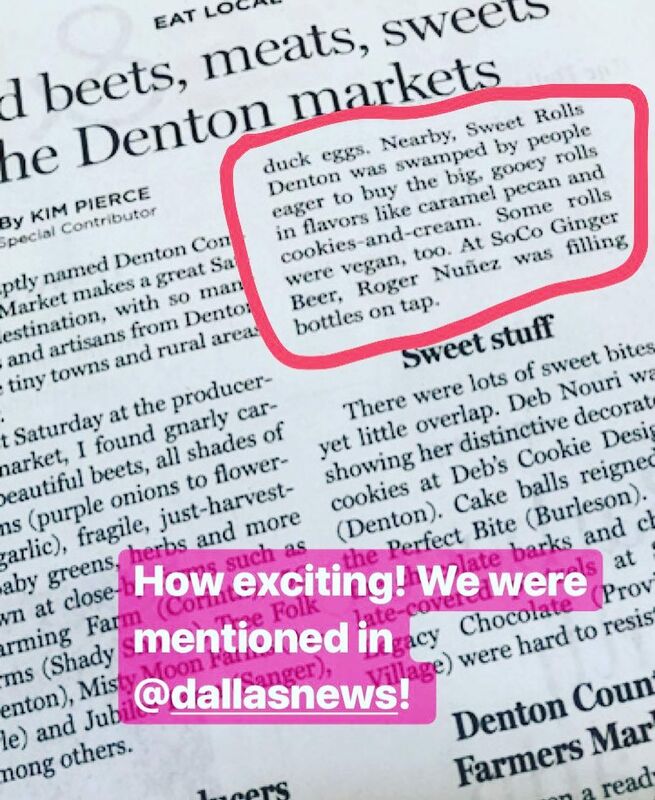 You can find us April-November on Saturdays at Denton Community Market (317 W. Market Denton, TX) from 9:00 am – 1:00 pm. Do I have to make a deposit? What are your payment methods? Full payment is due within 24 hours of receiving payment request to complete order. Payment request will be sent via email through Square (a secure online payment outlet). We accept all major credit cards. Sweet Rolls! We specialize in Cinnamon Rolls with a Twist-- Caramel Pecan, Classic Cinnamon, Vegan Cinnamon/Pecan and a Flavor of the Month! Our Sweet Rolls are made from scratch using unbleached flour, real butter and other basic ingredients found in homemade baked items. Do you have any vegan sweet rolls? What vegan substitutions do you use? Yes, we regularly offer vegan cinnamon/pecan sweet rolls. Our vegan rolls contain no animal/animal byproducts. We use bone char free sugars, organic vegan butter substitutes and high-quality vegan butter. Our non-vegan rolls contain eggs, dairy, wheat, corn (in the form of cornstarch in confectioner’s sugar) and some contain nuts. Our vegan rolls contain wheat and some have nuts, depending on the selection. Allergy Warning: We bake with nuts, wheat, eggs and dairy products in our kitchen. Though we take great precaution in preventing cross-contamination, we strongly caution individuals with any of these severe allergies against consuming Sweet Rolls. We currently do not have gluten free options. Currently, we only offer a Saturday pick-up option. How do I store Sweet Rolls? Sweet Rolls can be stored at room temperature up to 24 hours. Rolls can be frozen up to 30 days. Thaw before warming. Do no refrigerate. Will you mail Sweet Rolls to me? We cannot ship Sweet Rolls. As a cottage food bakery, we cannot offer wholesale. As we are growing, we are open to the possibility of potential partnerships! Shoot us and email and let us know what ideas you have. Have a different question? Feel free to email us at info@sweetrollsdenton.com.